I lived with my Granny during the blitz...For whatever reason,and it surely couldn't have been for safety,we,and a few neighbours would sit in the lobby of her third floor tenement when the sirens went.Goodnes if a bomb fell we surely were sitting targets. I do recall however going to the shelter on one occasion. 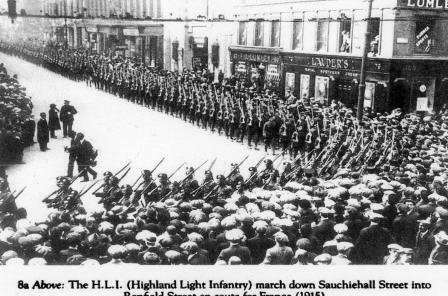 This was in Nelson Street,Southside. I already told this story on GG sometime ago. One of the neighbours was a very old Irish lady by the name of Mrs.Duke....She wore a black shawl,which was the style then..She would sit in the lobby with us,reciting the rosary on her beads. I do recall,that when we heard what seemed like a bomb hitting something somewhere, she would,while still reciting her prayers,shout a very definite swear word..She was quite the character. Her bachelor son who had a hump back, I apologize if that isn't the correct word, used to get drunk on a Saturday night, and we could hear her chasing him with a broomstick,and calling after him..."jist you wait,ya wee humpy back b----r. There was laughter even amidst the nightmare of War. There were numerous "aerial" bombs dropped during the war. These were really land mines on parachutes and exploded on contact. Their landings were indiscriminate and subject to the prevailing wind. However the Kilmun St. area received a load of 'regular' bombs. One story at the time was that the Kilmun St. bombs were really intended for the Maryhill Barracks nearby. If this was true the problem was solved shortly thereafter when hundreds of German POW's were moved by rail into the Barracks for the remainder of the war. My dad worked for the railroad and I personally saw the POW's from a signal box overlooking the Barracks. Catarina I think you will find a lot of us lived with our grannies at that time. Women worked shifts in the munitions factories , and of course Da's were away in the forces , so the dear Auld Grannies were lumbered wi the weans . I have lots of memories of the time I spent wi ma Granny and Granda. 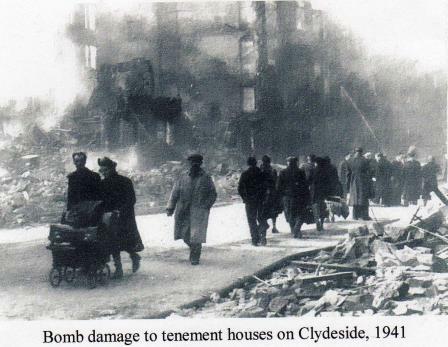 All I can add is that my Mum lived in Clydebank at the time and she was evacuated. Do know that my Gran and Grandad stayed on along with my Uncles. One of my uncles lost his life trying to wipe off one of the incendiary bombs. This is an interesting topic. I recently directed my first documentary, Post-Blitz Clydebank (http://www.post-blitzclydebank.co.uk/). The Blitz is a fascinating, but tragic part of my town's history. It all seems quite surreal to someone of my generation. However, after speaking to many local people who were actually there, it became very real in my mind. I remember , it must have been when Blackburn St was bombed, my mother saying Plantation had been hit. We livrd in Seaward St at the top end near Marlow terrace and had spent the night in the shelters. When we got back to our "hoose" 1up at number 240 everything was covered in soot. the Gerries had cleaned the chimneys. For years from when I was about ten years old I had a recurring dream. My Ma and I and "Auld Mary Gallagher " from next door were sitting on the back seat of a single decker bus, in the dark. The bus was bumping and bouncing all over the place when somebody up at the front struck a match and a voice in the dark said "Poot oot that effin' light" When I eventually told my Ma about this she reckoned I was about three when it happened and the "bus" was an air raid shelter during the above mentioned bombing. I can still remember it plain as day and I'm well into my 60's . I lived in Drumchapel at this time and used to go to an Ack Ack gunsite. We called it "big Bertha" when it was firing at the German planes. It had a sort of characteristic thump thump thump sort of sound. Anyway the guys at it told my pal -we used to go up and sell them lemonade and stuff from the local shop- they ran out of ammo the first night of the Clydebank Blitz! By 1943 they had a lot of women in the camp. I was told that the Germans flew over so low they could not really shoot up at them in early 1943 when the Germans had a raid. These Ack Ack guns broke more windows and roof slates. I dont think they ever hit anything. Then my grandpa was in the Home Guard and he used to go up to Hardgate Golf Course where they had a missile Z rocket battery I dont think it ever got fired. Then there was the smoke truck that went up and down Drumry Road. Idea was the smoke covered Clydebank. Dont think that ever worked but used to see it. I think they were based in Knightswood around Dyke Road or Archerhill Road. I saw the trucks their a few times. Then there was the mobile searchlight units. I think one was at Sunnyside Drive on Great Western Road. My memory is not so great as it was long long ago. Does anyone remember the Prisoners of War in black sort of track suits with big triangles/ diamonds or circles in purple on the back working on the local farms? Did these purple things on the back mean anything? I think most of the local POWS were Italian but I do remember a few Germans. One was a young Austrian lad. Heard he married and never went home.